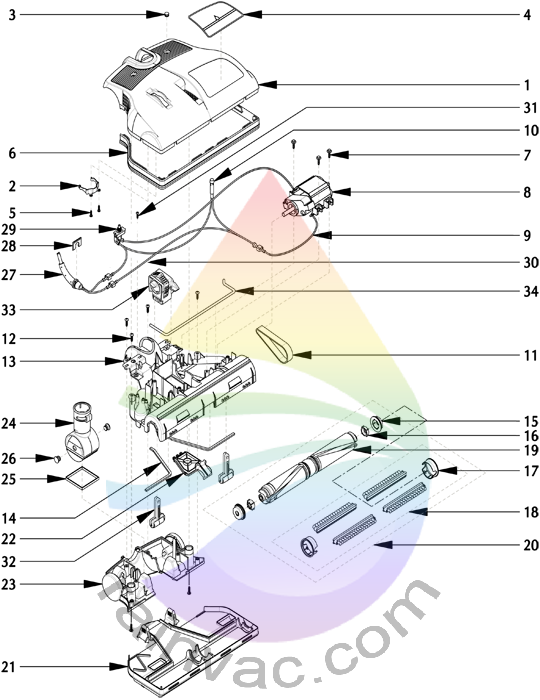 This schematic covers the complete Rainbow PN-2E power nozzle second version assembly that includes the original motor, updated manifold, and sole plate. This design removed metal springs from the roller struts and designed them into one solid piece. Effective serial number 7303305 with a start date of November 17th 2000 through serial number 7617931 and an end date of December 8th 2003. Cover assembly for the second version PN-2E screw together design power nozzle. The cover assembly does not use the air barrier for the motor. Has circuit breaker hole and red power light lens. If you want to use this cover assembly on the original PN-2E power nozzle, remove the air barrier that goes on top of the motor as it is no longer needed. Works with the R8401 power nozzle motor and R8201 manifold. This cover may have a manufacturer number of R-12058 stamped into the inside. This is an exact match to this item. Upright lock clip for the early PN-2E and PN-2 power nozzle. If the wand does not stay upright any longer, this could be the fix. Red lens for the pilot light that fits the PN-2 power nozzle. This lens is different is size compared to the lens for the R-series power nozzles. Applique for the top cover of the PN-2E power nozzle. This decal matches both the E-2 e SERIES and E2 Type 12 Gold series Rainbow. This small black screw fits all the electric hose handle assemblies from 1990 through current production. It also fits the newer design AquaMate I system as well as the first and second version PN-2E and PN-2 upright lock clip. Factory OEM replacement bumper for the PN-2E power nozzle. This part helps keep your furniture and walls from getting damaged while vacuuming. Original OEM factory motor for the early PN-2E and PN-2 power nozzle. Please review the schematics to confirm correct part. This part only comes with one wire as the other wire either comes directly from the power cord or direct from the wire harness. Old Rexair factory part numbers were R8368, R5670, R5655, and R5570. This motor can be used in both the PN-2E screw together design as well as the early version snap together version. Effective from serial number 6000000 through 7763129 and from manufacture date April 1994 through July 12th 2005.
if your end bearing on the R8401 motor is worn out and everything else is in perfect condition, then you can replace with this item to be back in working order. The R8401 motor was installed in the early version PN-2E and the PN-2 power nozzle. Carbon brush kit for the R8401 motor that fits the early version PN-2E Gold and PN-2E power nozzle. If your armature is in great condition and your brushes have over 75% wear, then a quick replacement of this item will get you back like new. Wire lead the works with the R8401 motor and runs to the wire harness. This lead will come with the purchase of the R8401 motor assembly. Pilot light and harness for the PN-2 power nozzle. The light almost never burns out so be sure to look for other issues before you determine this part is the problem. 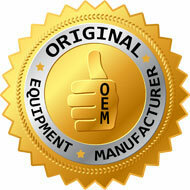 Standard factory original OEM belt that fits the PN-2E, PN-2, R-4375C, R-2800C, R-1650C, and R-1650A power nozzle. Does NOT fit the PN-12 or R1024 series power nozzle. These power nozzle models came standard with the E2 Type 12 (Silver, e2 Gold), E-2 (e SERIES™), D4C Special Edition, D4C, D3C, and D3A. Random numbers that you may see stamped on this belt include 7823, 6546, 3387, 1894. Replace once per year for optimal performance. Note: This belt during normal use will heat up and stretch. Over time it loses elasticity and doesn't provide the torque to clean at optimal efficiency. This is the #1 reason for a loss of performance. This original factory manifold works with the R8401 motor assembly. This manifold is used on the PN-2E power nozzle, versions 1,2, and 3. This part fits the screw together design and became effective for use from serial number 7000000 with a start date of May 1st 1998 through 7645115 with an end date of March 25th 2004. If you have the first version PN-2E which ran from serial number 7000000 through 7303304, you may need to update your R11676 roller strut assembly, as well as the R11092 thumb wheel assembly if you replace this part. Original version thumbwheel and struts will not work. Some late versions may have R11087 or early version R8144 manufacturing reference numbers stamped on them. Manifold gasket for the R8201 and R12900 manifold. The R8201 manifold fit versions 1, 2, and 3 of the PN-2E power nozzle and also the PN-2 power nozzle. The R12900 manifold fit the version 5 PN-2E power nozzle. This bearing shield fits power nozzle models PN-2E and PN-2. If you belt is on the side of the brush roll, then this is the WRONG PART. This part DOES NOT come with the R5592 bearing boot. Please be sure to order as most times you need both. Bearing boot for the R5590 brush roll assembly that came standard for model PN-2E and PN-2 power nozzle. If you bearings burn out from locking up due to debris or moisture, this part is what you will smell when you notice a burnt rubber odor. Factory OEM end bearing / stud for the R5590 brush roll assembly. If you experience noise or vibration from the power nozzle, then this could be your problem. Fits all the PN-2E and PN-2 power nozzles. Thread guard for the R5590 brush roll assembly. Your brush roll takes two of this item. This kit includes four brush strips and two thread guards for the center belt driven brush roll that fits models PN-2E and PN-2. This kit includes four soft brush strips and two thread guards for the center belt driven brush roll that fits models PN-2E and PN-2. The soft brush strips help prevent the skipping effect while vacuuming some types of carpet. Stripped brush roll for the power nozzle model PN-2E and PN-2. This item does include the end bearings. Brush strip for the R5590 brush roll assembly. The brush roll requires four total and needs to be installed correctly. Look closely on how the original brush strip is installed and be sure to install the new one the same way. The raised bar side needs to be in the correct position or it will effect performance. Also be sure to install the brush roll assembly correctly. The groove that is cut on one end of the brush roll needs to be installed with it on the same side as the spare belt compartment. Installing the brush roll backwards will effect performance. Your owner's manual will show you correctly how to install. If you have an issue with your power nozzle "skipping" across the carpet, then this replacement part can help. You can also try vacuuming in a different direction to see if that helps solve the issue. Beater strip without bristles for the R5590 brush roll assembly. Fits the PN-2E and PN-2 power nozzle. Replace the brush roll on your PN-2 and PN-2E power nozzle if you experience a loss of performance due to damaged bristles or worn parts. Complete original standard brush roll assembly for the center belt driven Rainbow model PN-2E and PN-2 power nozzle. Comes with end bearings, caps, etc. The bristle length on this brush roll is 73/200 inch or .365 inch. Comparison 3/8 inch is .375 inch. So the bristle length on a new brush roll assembly is just shy of 3/8 inch. The bulk item number for this is R12094B. Some websites list this part number for a single item which is incorrect. Brush roll assembly that includes all soft brush strips to help prevent skipping on short pile carpet. Fits the PN-2E and PN-2 power nozzle. Brush roll assembly with the hard bristles and beater strips installed. Good for thick carpet or heavy tracked carpet to help bring back fibers to upright position. Brush roll assembly that includes the soft brush strips and beater strips to help prevent skipping on short pile carpet. Fits the PN-2E and PN-2 power nozzle. Front sole plate for the screw together design PN-2E power nozzle. If your power nozzle is disassembled by removing the large wheels, then this is the wrong part. Effective serial number 7000000 with a start date of May 1st 1998 through 7645115 with an end date of March 25th 2004. Original item number was R7806 before it was replaced with this item. Some early versions will have R7869 on a silver label. This number is the part number for the label itself and not the sole plate complete. Belt cover for the model PN-2E and PN-2 power nozzle. Inexpensive replacement if you happen to damage while trying to remove. Rear sole plate assembly for the early version PN-2E and the PN-2 power nozzle. Effective serial number 6000000 with a start date of April 1994 through serial number 7645115 and an end date of March 25th 2004. Previous version of this item had (6) screw posts. Manufacture number on the PN-2 was R5610 stamped inside. The PN-2E (6) post had manufacture number R11097 marked inside. This item with an R12059 stamping is a (4) post revised version and is a direct replacement for all other variants. This revised item replaces discontinued items R11097 and R5610. There is no modifications that are needed. Replace cracked or broken power nozzle wheels to avoid scratching your bare floors or snagging carpet fibers. Rear wheel for the model PN-2E and PN-2 power nozzle. These can certainly be removed without damage but if you happen to break one during service, then a replacement will not set you back in cost. Fits the early version PN-2E power nozzle that works with the R5836 upright lock clip. If you replace your cover assembly, you will need to upgrade to the R12069 pivot arm. Be sure to check schematics to confirm correct fit. Effective through power nozzle serial number 7499524. Gasket for the pivot arm that fit the PN-2E and PN-2 model power nozzle. Clevis pin for the pivot arm on the Rainbow model PN-2E and PN-2 power nozzle. Original factory OEM electric power cord for the early version PN-2E power nozzle. Effective serial number 7000000 with a start date of August 5th 1998 through serial number 7645115 and an end date of March 25th 2004. This cord may have R7203 stamped into the end of the plug. This number is also stamped onto several over versions so you can't go by R7203 as an exact match. Circuit breaker for the PN-2E and PN-2 power nozzle. Some early version PN-2 power nozzles have the larger R5612 version. This is a factory approved direct replacement. If you have a trigger in your electric hose that turns the power nozzle on / off, then you do not need to use this part. If something goes wrong, (ex. stuck sock, rug, etc. in brush roll) all you have to do is let off trigger, you don't need to worry about having a circuit breaker to trip in order to protect the motor. Just take wires that are going to this part, and wire them all together. Old part numbers include R11077 (PN-2E), R5612 (PN-2). Roller strut for all PN-2E power nozzle designs. This part has been improved over the original design that use springs and was screwed into place. This revised version is a direct replacement for the original design and does not require modifications for this to fit. Some older model PN-2E power nozzle thumbwheels are starting to stick, this is an improved factory replacement. The pivot bar raises and lowers the struts to allow for height adjustment on different length of carpet. Fits all PN-2E power nozzles.